International manufacturer of basic and specialty chemicals including basic polymers, solvents and olefins. Manufacturer of specialty chemicals, pharmaceutical intermediates, flavors and fragrances, basic adhesives and metal carboxylate dryers. Manufacturer of basic chemicals, fine organics, laboratory chemicals, and metal pretreatment and finishing products. India. Group of companies, active in the development and manufacture of basic bulk chemicals, dyestuffs and pigment intermediates, and chemicals and intermediates for the pharmaceutical, agricultural and rubber industries. Also, specialty chemicals, and custom manufacturing services. Comprehensive product catalog. Distributor of a broad range of chemicals in Zheijing, China. Products include basic organic and inorganic chemicals, reagents, coatings, and intermediates, as well as labware and soil sampling equipment. USA. Manufacturers of high-performance resins, adhesives, coatings and basic chemicals for a wide range of industrial applications. Melamine and phenolic liquid resins, and wax emulsions for the textile and nonwovens industries. Extensive technical information on PDF files. Part of the Henkel Group. An importer and distributor of basic and specialty chemicals in Poland. USA. Construction materials, and basic and specialty, toll and contract manufactured chemicals for the textiles, pulp and paper, water treatment, and environmental services industries. Process chemicals for appearance and performance enhancement of fibers, textile fabrics and garments. Detailed product descriptions. Link to educational science resources. Producer of polyethylene and polypropylene resins and basic petrochemicals and synthetic materials. Indian exporter of basic chemicals and intermediates. Includes company profile and product catalogue. Diversified manufacturing company, active in chemicals, polymers, fertilizers and metal. Supplier of compound fertilizers, amino acids and basic organic and inorganic chemicals. Producer and marketer of basic chemicals, petrochemicals, polymers, plastics, and specialty products. Manufactures basic products for the chemicals, plastics, detergent, personal care, rubber and packaging industries. Chemical supplier, importer, and exporter in China, carrying a diverse range of basic organic and inorganic chemicals. India. Manufacturers of acid, basic, pigment, solvent and vat dyestuffs, and dye intermediates for the textile industry. Also, toll manufacturing services. Basic Chinese manufacturer of herbicides,insecticides,fungicides and growth regulators. Located in Jiaxing, Zhejiang Province. Manufacturing and supplying of high quality basic dyes, solvent dyes, pigments and other chemicals. Distributor of food flavors, fragrances, food colors, basic chemicals, and essential oils in Asia. Global supplier of basic inorganic chemicals, olefins and polymers, and specialty materials into industries including semiconductors, pharmaceutical, health care, and food. Producer of basic industrial chemicals and materials. Includes products, history, locations, and contact information. Manufacturer and exporter of chrome oxide green, chromic acid, sodium bichromate and basic chrome sulphate. Manufacturer and exporter of chrome oxide green, chromic acid, sodium bichromate, and basic chrome sulphate. Manufacturer of acid, basic and direct dyes, dye intermediates and chemicals for the petroleum, ink, plastics, coating, and textile industries. Also toll product development and manufacturing services. Chemical suppliers, manufacturers and traders of chemicals - inorganic chemicals, medicinal chemicals, botanical chemicals. If the business hours of BP Chemicals in may vary on holidays like Valentine’s Day, Washington’s Birthday, St. Patrick’s Day, Easter, Easter eve and Mother’s day. We display standard opening hours and price ranges in our profile site. 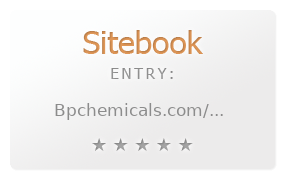 We recommend to check out bpchemicals.com/ for further information. You can also search for Alternatives for bpchemicals.com/ on our Review Site Sitebook.org All trademarks are the property of their respective owners. If we should delete this entry, please send us a short E-Mail.